Conveniently located between Syracuse and Watertown, New York, directly off Interstate 81, Exit 34, the Mapleview Family Restaurant continues to be a main stay for local patrons as well as hungry travelers. Celebrating twenty years of serving our Guests, our focus has always been to offer the traditional favorites you would expect to find at a great family restaurant, plus untypical fare that surprises! Satisfying portions, great taste, and value will bring you back! We continually challenge our kitchen team to provide a huge variety of breakfast, lunch and dinner favorites. 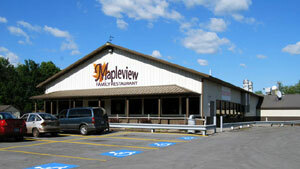 The Mapleview Family Restaurant is open 6 am-10 pm seven days a week offering breakfast, lunch and dinner. We truly appreciate you as a Guest. ALL OF US AT THE MAPLEVIEW FAMILY RESTAURANT!